Production forecasting of important agricultural crops using satellite remote sensing data initiated under the project “Crop Acreage and Production Estimation” by Space Applications Centre and carried out over a period of two decades at the behest of Ministry of Agriculture, Govt. of India (MOA). Subsequently a more inclusive model FASAL (Forecasting agricultural output using Space, Agro-meteorology and Land based observations) was initiated in 2007-08, and SAC entrusted with the responsibility of implementing Space technology based production forecast of crops and upgradation of the procedure with new data availability. Procedures for multiple forecast of 6 crops viz: Jute, Kharif rice, winter potato, rapeseed/mustard, Wheat and Rabi rice has been done. Realising the need to integrate this advanced technique in the routine crop statistics gathering, Department of Agriculture and Cooperation (DAC), Ministry of Agriculture, Govt. of India initiated steps to set up a centre for this purpose. Accordingly, the centre “Mahalanobis National Crop Forecast Centre” (MNCFC) has been set up at PUSA, Rajendranagr, New Delhi. Thus, the centre will be carrying out the operational forecast of the cops from 2012-13 season onwards. 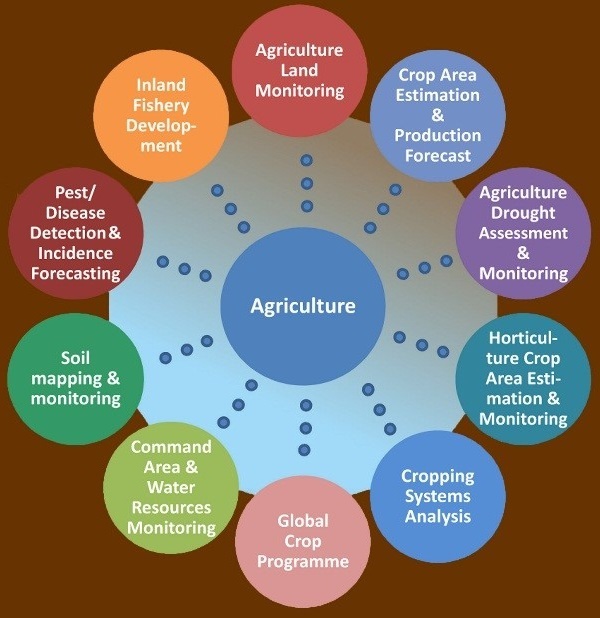 SAC is now concentrating on developmental activities related to crop forecasting for other crops viz., sugarcane, cotton, soybean, pulses etc., use of new sensors, procedure development, parameter retrieval, biomass estimation, pests and diseases assessment etc. One major work component identified under FASAL for 2012 is use of the new Indian C बैंड Synthetic Aperture Radar (SAR) data from Radar Imaging Satellite (RISAT-1) on various aspects of crop production forecast and condition assessment. The current FASAL R&D activities include Techniques for Early Area Estimation of new crops –Sugarcane (using AWiFS), Cotton, Soybean (using SAR), INSAT CCD–NDVI product generation and experimentation on International Crop Assessment using EO Data. Beyond FASAL SAC is involved in National Food Security Mission (NFSM of DAC) –initiations such as Bringing Green Revolution to Eastern India (Monitoring the impact on rice production), Forecasting disease and damage desection (Yellow rust in wheat), Pulse crop intensification assessment and Techniques Development for Prototype for crop insurance. All Rights Reserved with Space Applications Centre.